O’Connell Street runs through the heart of Limerick, and still retains many of its original and once-elegant Georgian houses, first built as townhouses, but now mainly consisting of shopping units on the ground floors and office accommodation on the upper floors. One eye-catching example of this combination of Georgian domestic architecture and Victorian stucco work as the houses were adapted to burgeoning commercial needs can be seen at Timberland, at 112 O’Connell Street. This former townhouse stands at the corner of O’Connell Street and Shannon Street in the heart of Limerick’s commercial centre. 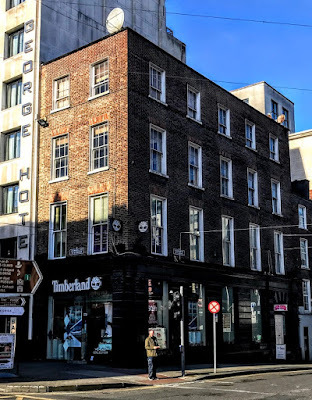 Its place where these two important streets meets in the city centre gives this building additional value and architectural interest that enhance the streetscape. No 112 is a four-storey-over basement brick building dating from around 1800, when it was built as a corner-site, end-of-terrace house. Two bays face onto O’Connell Street, but the five main bays face onto Shannon Street. I find the most interesting and engaging part of this building is the elaborate stucco-fronted shopfront that was added around 1860, providing at attractive ground-floor façade. There is a heavy cornice on the ground floor above the plain frieze and channel rusticated rendered walls on a moulded plinth course. 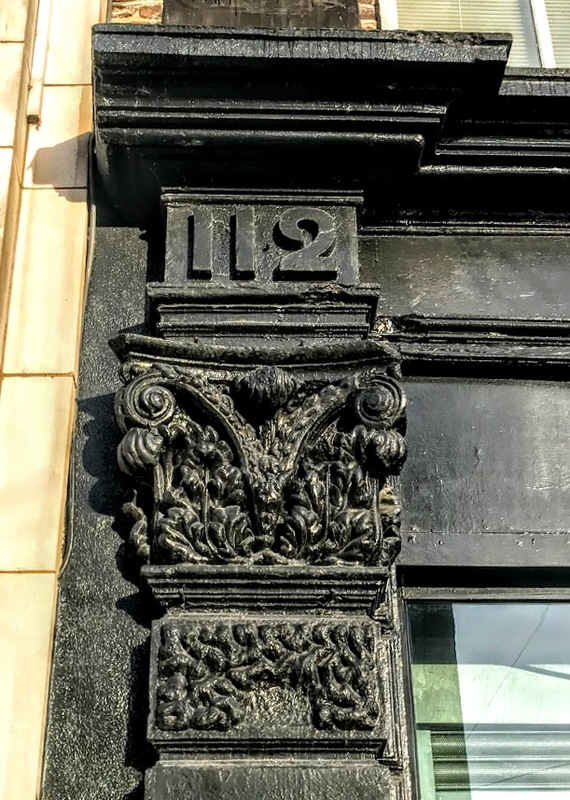 Underneath the heavy black paint, there are five beautiful pilasters with flamboyant composite order capitals and alternate vermiculated blocks that occupy the building ends and also frame the door opening on Shannon Street. There is a square-headed, fixed-pane glazed shopfront on the O’Connell Street front, while there are while four square-headed fixed-pane window openings on the Shannon Street front, corresponding to the bays above. The roof is hidden behind a rebuilt parapet wall with covered coping, and the building also has a concealed basement. 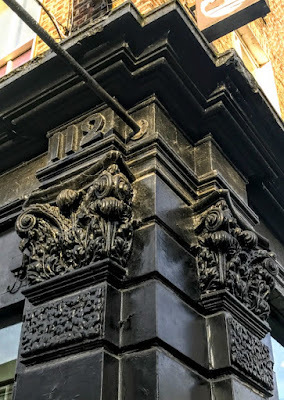 At the most westerly bay on Shannon Street, there is a three-point arched door opening with a voussoired rendered surround, and this also has alternating vermiculated detail. Here there is a replacement timber-panelled door, but the overlight and sidelights are retained, along with the five original curved limestone steps. Above, the building retains its Georgian upper floors. The red brick walls are laid in Flemish bond with cement pointing. 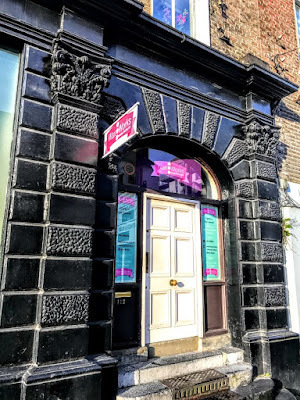 There are red brick flat-arched window openings with patent rendered reveals and painted limestone sills, with replacement timber sash windows that have horns. There is some cylinder glass in the second-floor windows.